Container based applications are exploding in popularity as they simplify and speed up application development and deployment. Thankfully, technologies such as Docker, Kubernetes, and Mesos help to orchestrate and manage the containers. But with their dynamic nature, how do operations teams get their heads wrapped around inter container connectivity? How do they get full visibility across the entire fabric? How do they understand what was, or was not, working 10 minutes ago and why? In this webcast, you’ll learn about the popular container networking models and the pros and cons of each. You’ll also see how to track each container’s identity and bandwidth, how to simplify network port mapping, and realize the benefits of telemetry analysis through the entire fabric for enhanced troubleshooting. Orchestration tools for Linux containers can work in concert with Linux networking tools to help operationalize container based applications -- it’s just common sense. Come join us to find out how to make this a reality in your environment. As organizations grow and adapt to the digital age, networks must deliver richer application experiences to customers and connect more and more users. Agility is required in order to deliver compelling, brand-building, revenue-generating experiences. If there's ever a connection problem, the impact is significant and troubleshooting often requires manual, box-by-box intervention. There needs to be a better way. Luckily, Cumulus NetQ addresses these issues of network complexity and performance reliability. Cumulus NetQ reduces network operational headache by providing actionable insight into every trace and hop in the network — from the container, virtual machine, or host, all the way to the switch and port. Join Cumulus Networks & Mesosphere to learn the drivers behind the growth of containers in data centers of all sizes. We'll explore the top uses for containerized operations and discuss the implications on the network. • Ways that you can use new network softwares to maximize visibility and connectivity within your container environments. • How to improve reliability and simplify operations in the cloud. Wondering what the difference is between traditional networking with Cisco and Juniper and open networking with Cumulus Linux? Learn the key differences in this video series. In this video, The instrcutor explains how engineers of all backgrounds can use Cumulus Linux using NCLU. Join Cumulus Networks and guest speaker Andre Kindness from Forrester as we explore the latest technology shifts in data centers today. As cloud, containers, microservices and other technologies become more and more mainstream, software must be architected in new ways to address these smaller components. All of this is impacting the the data center network, and we will talk through some of the ways that organizations can address the changes in the ever more complex data center. If you are an I&O professional, watch this webinar to see how you can simplify deployment and maintenance in the modern data center. The software-defined data center has been a heavily touted concept over the past few years, and heralded by some as the next step in the evolution of virtualization and cloud computing. Having a data center that is governed by software, rather than dictated by hardware, can lead to more fully automated and intelligent operations. Having infrastructure elements such as networking, storage and security conceived of as a services is, indeed, an attractive concept to many. 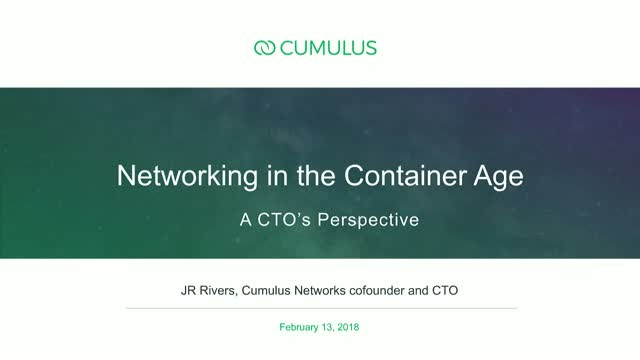 In this webinar we will be joined by JR Rivers, Co-Founder and CTO of Cumulus Networks, to talk about how he (and Cumulus) define the concept of a software-defined data center. He will present how the definition of a software-defined data center has evolved since its inception, and how tools like VXLAN, EVPN, Ansible and more can help organizations further their journey to a “software-defined” state and simplify network operations. Packet buffer memory is among the oldest topics in networking, and yet it never seems to fade in popularity. Starting from the days of buffers sized by the bandwidth delay product to what is now called "buffer bloat", from the days of 10Mbps to 100Gbps, the discussion around how deep should the buffers be never ceases to evoke opinionated responses. In this webinar we are joined by JR Rivers, co-founder and CTO of Cumulus Networks, who has designed many ultra-successful switching chips, switch products, and compute platforms, to discuss the innards of buffering. This webinar will cover data path theory, tools to evaluate network data path behavior, and the configuration variations that affect application visible outcomes. In episode 2 of our series on automating network configuration, we will dive deeper into the how-to's for managing an automated network in production. We'll walk you through the model of CI/CD (Continuous Integration / Continuous Delivery), including deploying changes with more confidence than you could before. We'll show you how Cumulus Linux simplifies much of automation thanks to simplifications and innovations in configuration from CLAG to Open Shortest Path First (OSPF) and Border Gateway Protocol (BGP). Come prepared for a lively webinar with real-time demos and active audience participation. Network automation may seem passe now; seemingly everyone knows how to do it. You want to join the ranks, but where to begin? And what does the journey look like? In this 2 part webinar, we'll go from soup to nuts on automation of network configuration, from downloading Ansible to doing continuous integration and continuous development with network operations. Along the way, we'll demonstrate how Cumulus Linux simplifies much of automation thanks to simplifications and innovations in configuration from CLAG (Chassis Link Aggregation) to OSPF (Open Shortest Path First) and BGP (Border Gateway Protocol). Even if you think you know BGP unnumbered, come see how we've simplified it even further. We'll walk through configuring L2 networks, L3 networks, and VxLAN overlays. Automation. Everyone wants it, even if not every one can readily switch to it. Manual workflows are still quite common in today's networks and while Linux supports manual workflows, some traditional network operators find administering networks with the standard Linux network commands challenging. With NCLU, Cumulus Linux makes manual workflows first class citizens in the network operator toolchain. Designed to please both Linux admins and traditional network operators, the primary goal of NCLU is to ease and simply the manual operation of networks. In February 2017, Facebook announced the first commercially available open networking chassis. Traditionally sourced through traditional vendors where all components must be sourced from a single provider, the open chassis is the next step in web-scale networking for the masses. Join this webinar to get an overview of the technical architecture of the backpack and learn how the availability of this new model, is making it simple for data center operators to take advantage of the first open ecosystem chassis. Plug into to learn how you can take the web-scale IT principles of innovators like Facebook, Google, and others to your organization simply and cost-effectively. Bringing web-scale networking to Enterprise cloud. Cumulus Networks is leading the transformation of bringing web-scale networking to enterprise cloud. Its network switch, Cumulus Linux, is the only solution that allows you to affordably build and efficiently operate your network like the world’s largest data center operators, unlocking vertical network stacks.